I have long been a fan of CBS’ The Good Wife. Yet, the quality of the actors and the show notwithstanding, I take exception t0 producers’ political stunt casting. The Good Wife is one several shows to hire real world political operatives to play themselves, so it is by no means the only culprit, just the most recent. 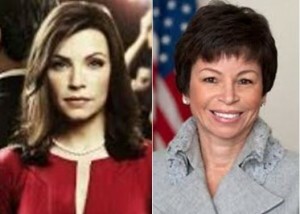 Their choice to cast Valerie Jarrett, arguably President Obama’s closest and most trusted advisor, to play herself on last night’s show was a travesty for a number of reasons. Second, Ms. Jarrett’s appearance added nothing. Like Donna Brazile before her (who has appeared on the show several times), they cannot act and are a distraction to otherwise solid entertainment. Both television and film dramas have long worked to blur the line between reality and entertainment. It doesn’t work. We know we are watching TV or a movie — we paid for the privilege. Seeing a real live politician or a news anchor (CBS’ Norah O’Donnell also played herself on The Good Wife last night) does not add an element of reality. It only distracts the viewer in a “look who that is” moment. Whatever value the scene had is lost. The only thing that lends reality to a story is a good script, good acting and direction. Period. Furthermore, there are any number of character actors trying to feed their families who would have been more than grateful to book any one of those gigs and I can assure you, they would all have done a better job. That’s why they call it acting. I don’t need Chris Matthews or Bill O’Reilly or Norah O’Donnell or Valerie Jarrett or any of them to get themselves a cheap thrill by hobnobbing with actors on a set only to take a job away from someone who could really use one. Every person I mentioned complains about or has reported on the problems of unemployment in the U.S. So how about not taking money from someone else when you already make buckets of it. Last time I checked, political operatives and news anchors already have a paying gig. To producers who makes this choice, please take a moment to think about the greater value to your story that you are missing by not hiring a talented, experienced professional who can actually support the material you have worked so hard to craft. Blurring the lines between entertainment vehicles, the news and politics cheapens all three. Actually, I think the show gets it exactly right. They show the politicians for what they are: criminals. Mencken, Twain, Will Rogers, they all had them pegged as such. Kudos to The Good Wife. It seemed like such an awkward encounter that was placed in the middle of an excellent drama. Also agree, let an actor work and make the whole thing better!! You hit it again, Anita. Couldn’t agree more. Using these people to play themselves on TV just reminds you that what you are watching is not real. It takes you out of the story. Besides the real actors need a paycheck and the insurance weeks. I agree completely. I felt uncomfortable watching her try to act. Please give the real actors a break. Thanks Susan. Give the actors a break is right. Not to mention it looks like the actors themselves are gawking cause they can’t believe who they’re talking to! Takes you right out of the material. Insurance weeks is right! And that is an excellent observation about taking you out of the reality of the story. Producers may not realize they are creating the opposite effect of what they intend. I fully agree. It adds little, and is more of distraction. co-star, they’d be onto something..